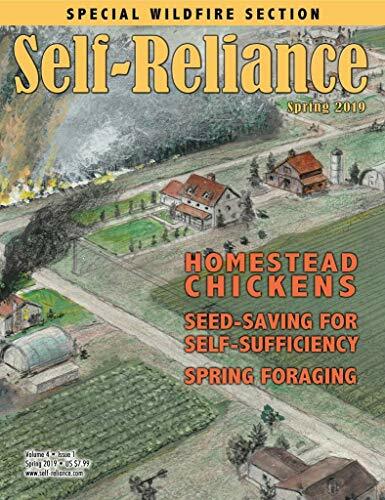 Self-Reliance Publications LLC - Self-reliance is a bi-monthly digital magazine full of projects and ideas to help you live a more self-sufficient, self-reliant, purposeful life — no matter where you live. Kindle magazines are fully downloaded onto your Kindle so you can read them even when you're not wirelessly connected. Backwoods Home Magazine - Backwoods home magazine is written for people who have a desire to pursue personal independence, self-sufficiency, and their dreams. We offer “how-to” articles on owner-built housing, country living, independent energy, gardening, self-employment, health, and other topics related to an independent and self-reliant lifestyle. Ogden Publications, Inc. - Each bimonthly issue combines practical articles, beautiful photos, do-it-yourself building plans, reader advice, product reviews, humor and a healthy dose of fresh attitude to offer a complete guide to life beyond the city limits. Grit magazine has celebrated rural American lifestyles since 1882. More information about Ogden Publications, Inc.
Ogden Publications, Inc. - Launched in 1970, each bimonthly issue of mother earth news features practical and money-saving information on cutting energy costs; using renewable energy; organic gardening; green home building and remodeling; fun do-it-yourself projects; and conscientious, self-sufficient lifestyles. Mother earth news magazine is the Original Guide to Living Wisely. Ogden Publications, Inc. - Capper's Farmer. Engaged Media - Step-by step instructions on how to provide energy to your home, prepare a first-aid kit, grow and preserve your own food, make water drinkable. Prepare yourself family for when disaster strikes. SO Publications Ltd - Knowledge is power, contained within the pages of each issue you will find a wealth of articles written by experts, taking you on a 'bushcraft adventure' even when you can't get to the woods! . Caribou Media LLC - The roads are clogged, communications are down. Do you have a plan of action? do you know how to find your family in the chaos? Do you have what you need to make it back home safely? Disasters — whether man-made or natural — present a whole different set of challenges in urban environments. Offgrid takes a fresh look at these and other emergency-related scenarios from the URBAN/CITY dweller’s point of view. Kindle magazines are fully downloaded onto your Kindle so you can read them even when you're not wirelessly connected. A large-scale disaster strikes while you’re at work. Athlon Media Group - Survivor's edge prepares you for real world disasters with the skills and knowledge to take on whatever armageddon comes your way from power outages to a knife assault to snake attacks. In our ultimate guide for staying alive, eye of the storm, we'll give you the resources to handle the three stages of survival-preparation, aftermath-across three categories of catastrophes. EG Media - Hobby farms is a bimonthly magazine highlighting rural living for pleasure and profit for hobby farmers, small production farmers and those passionate about the country. Whether you're getting your hands dirty in a city plot or on your land's back 40, our do-it-yourself guides and tips from other small-scale farmers will provide the inspiration and support you need to start your next farm project from scratch. At hobby farms, we know that growing healthy food and maintaining a sustainable farm hold top priority in your life. Outdoors Sportsman Group - Whether you collect, hunt, target shoot, have personal defense needs or some other firearms interest you'll find the largest variety and best prices on all the firearms, accessories and services that you could want or need!Kindle Magazines are fully downloaded onto your Kindle so you can read them even when you're not wirelessly connected.
. If you're serious about buying, selling, or trading firearms then Firearms News is for you.